made that experience so special was honoring a true hero and their family. And now, you get a chance to nominate this year’s hero, which the race will be named after in 2014. As the cars roll into Phoenix this weekend at the NASCAR Sprint Cup Series Race, the search for the namesake of the 2014 Brickyard 400 will officially launch, with the help of Packages From Home. The local non-profit organization, dedicated to sending care packages to active-duty troops stationed overseas, has teamed up with Crown Royal to kick off the brand’s “Your Hero’s Name Here” program, which honors a deserving American hero by re-naming the July NASCAR race at Indianapolis Motor Speedway in his or her honor. Packages From Home and Crown Royal will treat a group of local heroes from Luke Air Force Base to a VIP experience at this weekend’s NASCAR race. In addition to sending 20 military members to the race, two individuals are being recognized as the inaugural program nominees and will have the chance to have the legendary Indianapolis race named in their honor. 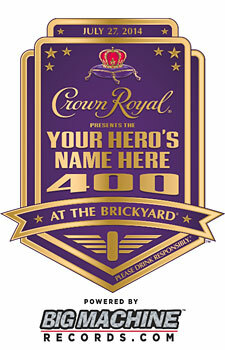 Consumers 21+ can visit CrownRoyalHeroes.com to nominate their own heroes for a chance to win naming rights to the race. Nominations will be accepted through April 13th, with finalists being announced at the end of April.